The new OS X Lion 10.7.2 build continues to list no known issues and asks developers to focus their testing on AirPort, AppKit, GraphicsDrivers, iCal, iChat, Mac App Store, Mail, Spotlight, and Time Machine. There are no new updates posted on the iOS side at this time. Apple has announced that it will be launching iOS 5 and iCloud this fall. The company has been rumored to be launching new iPhone hardware in early-to-mid October, and iOS 5 and iCloud should be going live right around that same time. Apple will almost certainly be holding a media event a week or two ahead of that launch to introduce the new hardware and give final details on iOS 5 and iCloud. I am too. Everyone should remember you will need Lion for iCloud and the latest versions of iWork and iLife to use it. Mobile Me Apple would have already shipped iCloud in back in July. The new Apple is spending more time testing it. 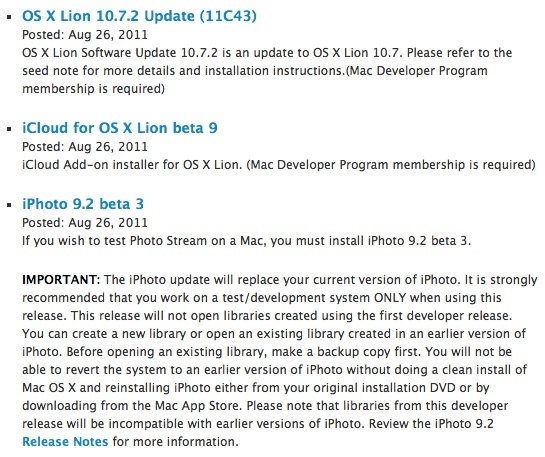 Apple has removed the compatibility subsystem for older applications from Lion. They want you to buy new systems and new software. They have an unexpected new expense - a CEO with a salary! Anyone know how to access the beta as I deleted my invitation email from SJ by mistake - honest! And then what, another shoddy rollout of 10.8. We all eagerly wait in anticipation of your complaints about it in the coming months. Did they *fix* the horrible new large icons in Launchpad?